Big thanks go out to JazzBumpa, Quilly, phd in yogurtry, Nessa, Tortuga, and Bing for submitting a plethora of great words last week! Next week’s word is courtesy of JazzBumpa! Thanks also to Jade, for offering to Tweet out to her friends and get some new blood into our Haiku community! Charged and fully rejuvenated after my Diwali vacation so here I am back!! Those are the best accidents. Lovely haiku. I forgot I can twitter, too. I am off. Oh I’ll tweet around too! Jenn your Haiku are very sweet too bad we cannot always feel like this! I was just thinking about nudging you by txt msg, in fact ;) Glad you made it! I was all wrapped up in Tuesday and didn’t realize today was Wednesday until about 40 minutes ago. Mea culpa. Please forgive me? I love the happenstance of bumping into old friends. I love the deliberation in keeping a relationship alive (no accident). Btw, my last post was NOT Bringing Up Baby. Comment Luv and I are not friends. They never seem to get it right. Great haiku Jenn! I kind of skipped the theme because I couldn’t think of anything positive and cheery so went accidentals over accidents! 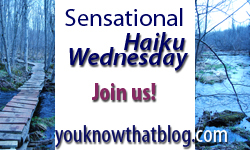 I love your haiku though, bumping into someone – great idea.